Click an image above or click here or here to share the above Facebook posts. Click an image above or click here or here to share the above Tweets. 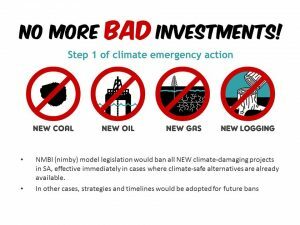 Take a look at the SA NMBI Talking Points to familiarise yourself with the issues involved with banning new climate-damaging projects in SA. 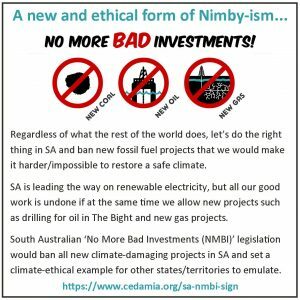 If you wish, you could download the short SA NMBI Powerpoint presentation at left and take it along on your laptop or tablet to show parts of it to your local state MP (or just to remind yourself of topics to cover), or simply print the sheets that you think you’ll find useful to leave with your MP. A NMBI Q&A doc can be downloaded here for your own reference. 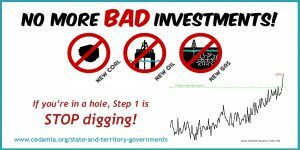 Or, you may wish to print a copy to take along when you speak with your local MP or for an info stall at an event. 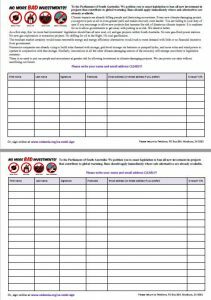 Download the above sheet as a pdf file, print, then ask your local MP to sign. Take a photo (landscape orientation preferred) of them holding up the signed sheet, and email it to us for inclusion on this website and social media. 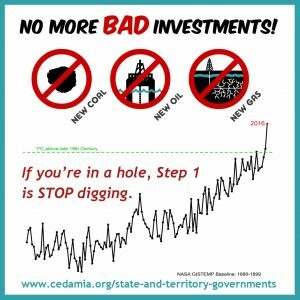 See the MPs and election candidates who have signed so far at https://www.cedamia.org/sa-nmbi-supporters/. 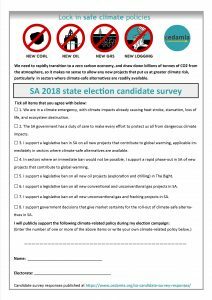 See the survey results received from candidates in the 2018 SA state elections at https://www.cedamia.org/sa-candidate-survey-responses/.